ACS San Francisco Bay Chapter Grant Awardees Kaytlin Ingman and Samantha Jane Cope will share their latest research findings with us. Jane Cope will present “Evaluating the influence of vessel noise on the underwater soundscape of San Francisco Bay.” Kaytlin Ingman will present “Long Term Trends in Baleen Whale Observations Near the Farallon Islands.” This event is open to the public, free of charge. Donations are greatly appreciated and will go toward funding cetacean research and education programs. Vessel traffic and marine mammal habitat overlap in the heavily urbanized San Francisco Bay. This traffic potentially threatens marine mammals in a number of ways, namely vessel collisions and acoustic harm. With a recent influx of cetacean species in San Francisco Bay, assessing these threats is essential. By integrating underwater acoustic data with the Automatic Identification System (AIS) and marine radar vessel tracking technology, we can begin to understand how vessel traffic influences cetacean habitat and the degree to which species may be at risk. Samantha Cope is pursuing her Master of Marine Science degree at San Francisco State University’s Estuary & Ocean Science Center in Tiburon, California. A student of Dr. Ellen Hines, Sam studies how vessels use San Francisco Bay across space and time and potential implications for marine mammal conservation. Sam received her Bachelor of Science degree in Environmental Science from the University of South Florida St. Petersburg. Large baleen whales seasonally use the Greater Farallones National Marine Sanctuary as a migration corridor and feeding ground during the productive upwelling season. Both basin scale climate patterns and local oceanographic conditions influence the timing and strength of local upwelling and nutrient quality. Modeling how these factors influence both the abundance and presence of humpback, blue, and gray whales can aid in the conservation of these protected species. We can also use these models to assess anthropogenic threats such as the increase in entanglements. 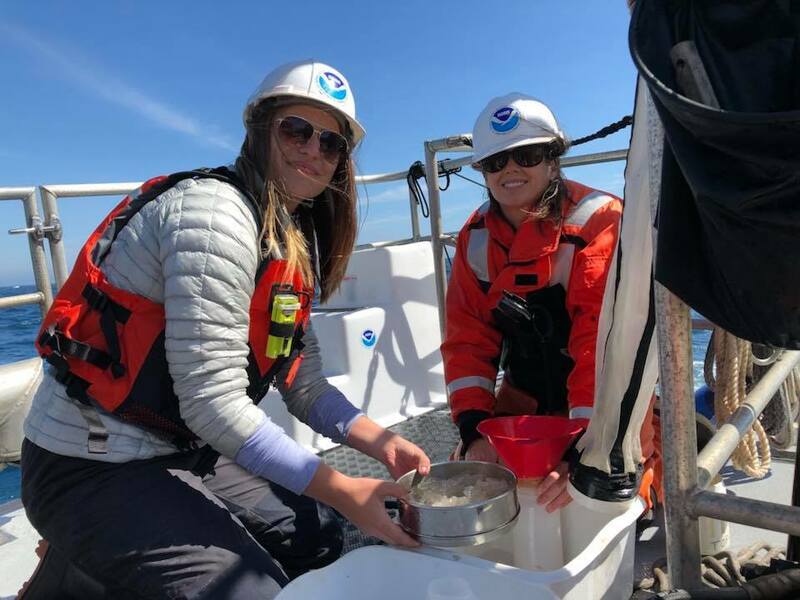 Kaytlin Ingman is currently a student of Ellen Hines pursuing a Masters of Marine Science degree at the Estuary & Ocean Science Center at the Romberg Tiburon Campus of San Francisco State University. Kaytlin studies how the abundance and presence of baleen whales is influenced by climate and local oceanography. She received her Bachelor of Science degree in Zoology from Washington State University.